The Department of An Taoiseach, this morning. Squint a little and it could be Athens..
Grand day for it in fairness. 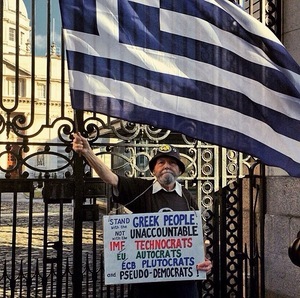 Posted in Misc, Politics and tagged ECB, Greece, IMF at 9:36 am on June 30, 2015 by Broadsheet. 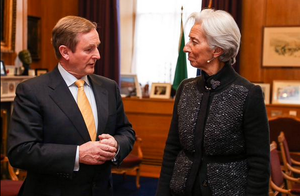 Taoiseach Enda Kenny and IMF Managing Director Christine Lagarde at Government Buildings this morning. 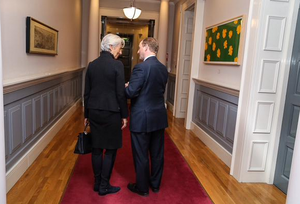 Posted in Misc and tagged Christine Lagarde, Dublin, IMF at 12:30 pm on January 19, 2015 by Broadsheet. A video comprising Irish Independent writer Colette Browne’s popular column from yesterday [denouncing the IMF debt ‘deal’] blended with Today FM’s Ray D’Arcy ‘impressively rocking out’ to the Black Keys’ Lonely Boy in a celebrated parody of the video for same. Some day all columns will may be presented in this manner. 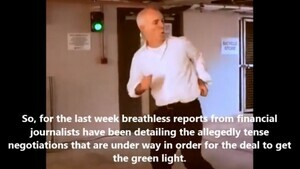 Posted in Misc and tagged Colette Browne, IMF at 7:00 pm on September 11, 2014 by Broadsheet. 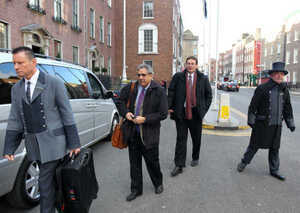 Completing its tenth review of Ireland’s bailout programme, which also saw it release the final €950m of its loans, the IMF said there needed to be resolution on the 25% of loans that are currently non-performing. The IMF said it was vital that this was achieved before the country enters the European banking union, and ahead of European stress tests due to take place next year. 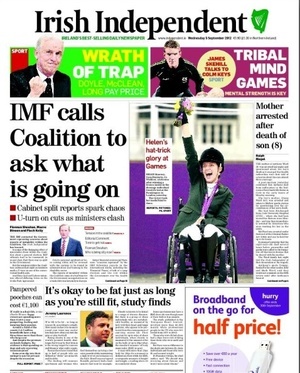 Posted in Misc and tagged banks, IMF, Irish Economy at 12:56 pm on June 18, 2013 by Broadsheet. 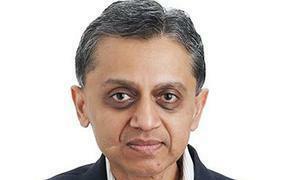 They’ve turned on Ashoka Mody. Posted in Misc and tagged Austerity, IMF at 12:44 pm on April 12, 2013 by Nat King Coleslaw. 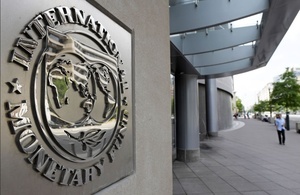 The outlook for economic recovery remains “highly uncertain” over the medium term, a new International Monetary Fund report has warned. The staff report concludes that the Government has achieved strong policy implementation of the bailout programme so far, and it refers to the fact that market access has markedly improved. But in a relatively downbeat assessment, the report also flags as as significant hurdles declines in domestic demand, high public and private debt, ongoing problems with profitability and lending in the banking sector. Referring to inadequate progress by banks, the IMF staff appraisal is that a sharp improvement is needed in dealing with non-performing loans. This is “critical to strengthen prospects for recovery”, it has stated. Seems Chomsky was being optimistic. Yesterday: Specialist Eviction Judges, You Say? 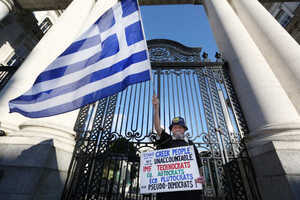 Posted in News and tagged Economy, IMF at 7:44 am on April 4, 2013 by Broadsheet. Specialist Eviction Judges, You Say? 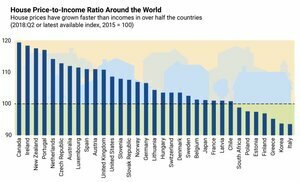 The latest IMF report card is in. They want more houses repossessed. 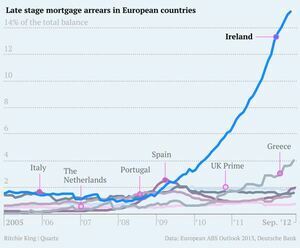 “The IMF states lenders are “only beginning to tackle non-performing loans”. Posted in Misc and tagged IMF, IMF review, Non-performing loans, reposessions at 4:38 pm on April 3, 2013 by Broadsheet. 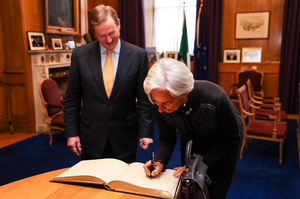 “We want Ireland to be a success,” and added she wanted to see how the IMF and the Irish authorities could best plan for a successful conclusion to the programme while making sure there would not be a relapse. “That is what I am most concerned about,” Ms Lagarde said. 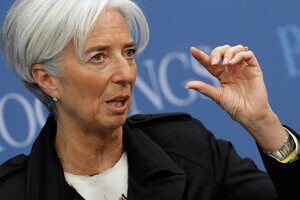 Posted in News and tagged Christine Lagarde, IMF at 6:52 am on March 7, 2013 by Broadsheet. Lizards Inc The International Monetary Fund. Like Ewok and Bodger post-Picnic. Posted in Misc and tagged IMF at 11:17 pm on September 4, 2012 by Broadsheet.